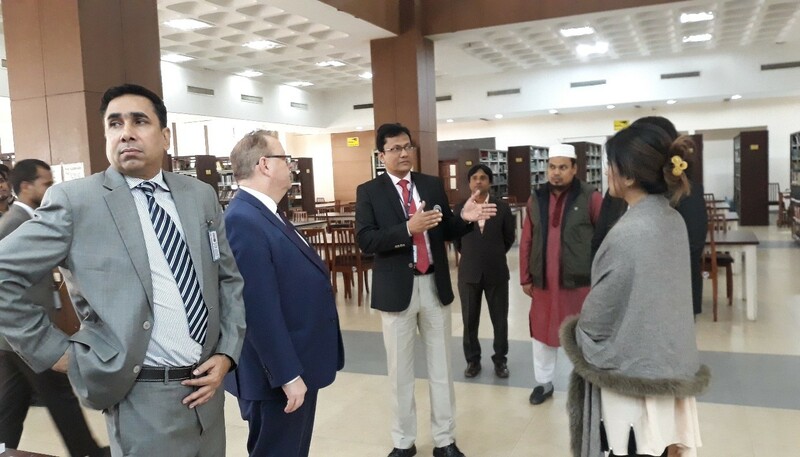 A four-member team led by Ms Jesmine Akhter, Director General (Additional Secretary) of Bangladesh National Scientific and Technical Documentation Centre (BANSDOC) is currently on an official visit to different Govt. 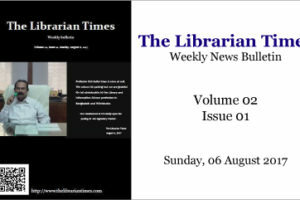 and national level library and information institutions/organizations in Australia. 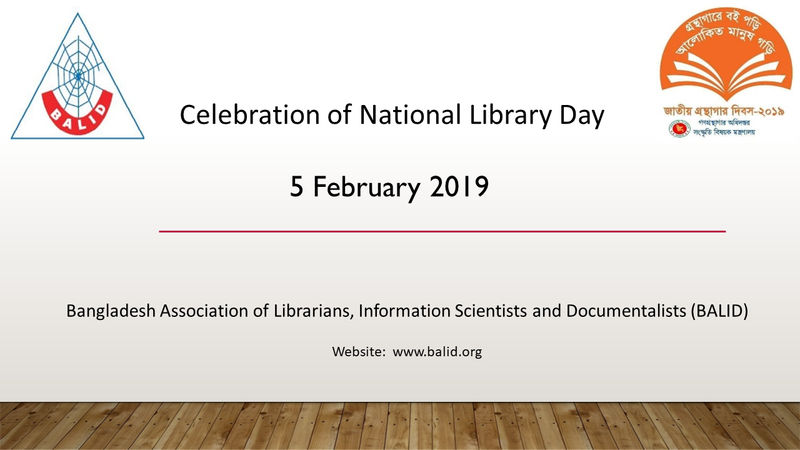 The purpose of their visit is to learn about the Australian Library and Information Sector and ALIA’s Accreditation of Library Courses as well as the ALIA PD Scheme. On the occasion, they visited the Australian National Library and ALIA House. The week-long visit will end on August 6, which started on July 29, 2018. It is expected that the gathered knowledge of this visit will add extra value in practising documentation, library and information services within BANSDOC and in the profession. Other members of the visiting team include Mrs Iti Rani Poddar (Additional Secretary (NP), Ministry of Science and Technology, Mr Mohammad Aslam Ali Khandkar, Photographic Officer, BANSDOC and Mr Md. Sayem Khan, Junior Reprographic Officer, BANSDOC. 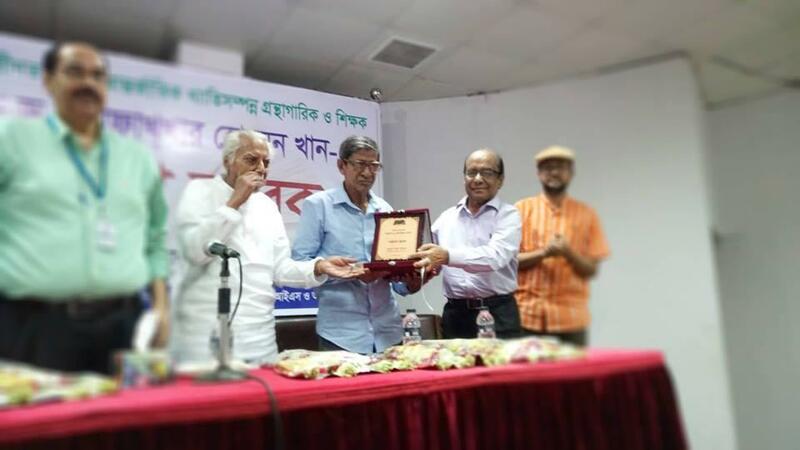 Prof. Dr Mofakhar Hussain Khan, the former librarian of the University of Dhaka, has received an ‘Honorarium Crest’ from the Ahmed Smriti Patagar. 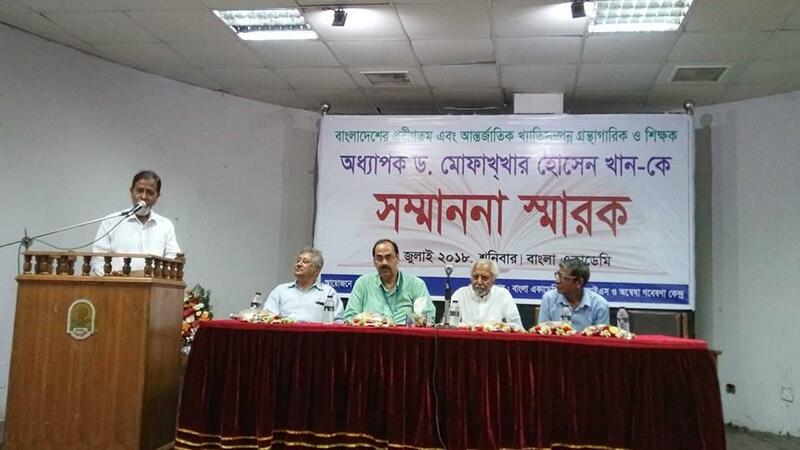 An event was organized at Shamsur Rahaman hall at the premise of Bangla Academy on 28 July 2018. Dr Khan studied different educational intuition at Bangladesh, USA and UK. He worked in different countries like Bangladesh, Iran, Nigeria and Saudi Arabia. Currently, he is living at Kaliganj Upazila in Gazipur. After receiving the award Prof. Khan expressed his feeling about the devotion of work and its importance. All participants in the event listened to his speech very deeply. 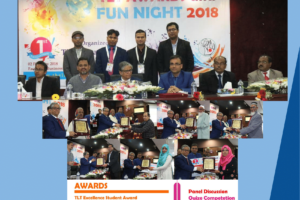 Prof. Shamsuzzaman Khan, Director General of Bangla Academy was the chief guest of the event while Mr M. Shamsul Islam Khan was the special guest of the event who was the former president of Library Association of Bangladesh. 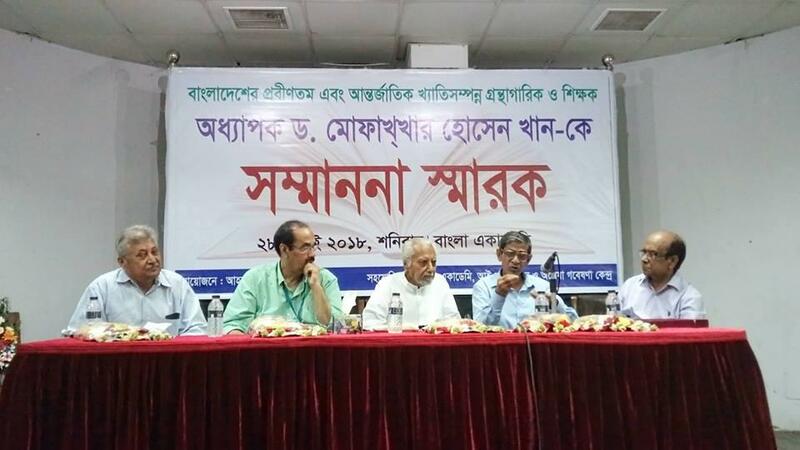 Mr Fazle Rabbi, former Director of Bangla Academy, National Book Centre, and founder of Ahmed Smriti Patagar presided over the program. 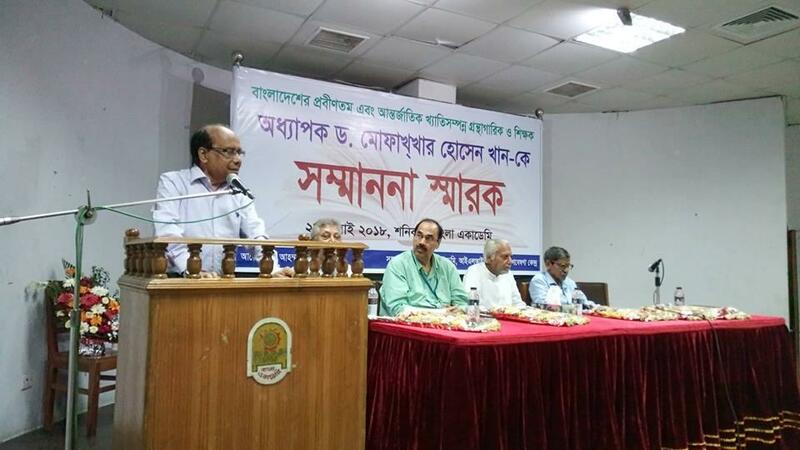 The welcome speech was given by Mr Kazi Abdul Majed, Director Institute of Library and Information Science, Dhaka. 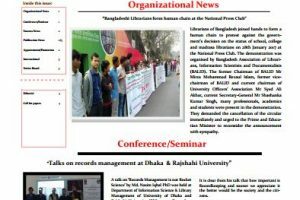 Mr Khandaker Fazlur Rahman, former Librarian, University of Dhaka emphasized on biography in brief on Dr Khan. 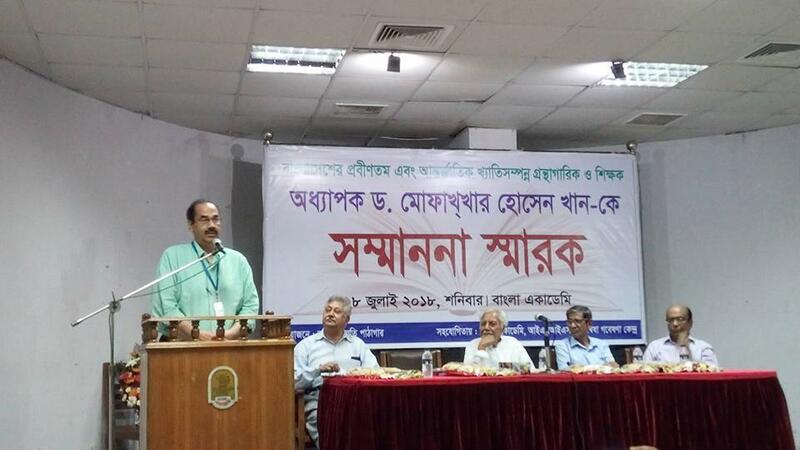 In addition, former Chairman of Jessore Education Board Mr Amirul Alam Khan discussed on Library movement activities of Bangladesh and its contribution of Dr Khan. Economist and Journalist Mr Azadul Kibria conducted this segment of the event. 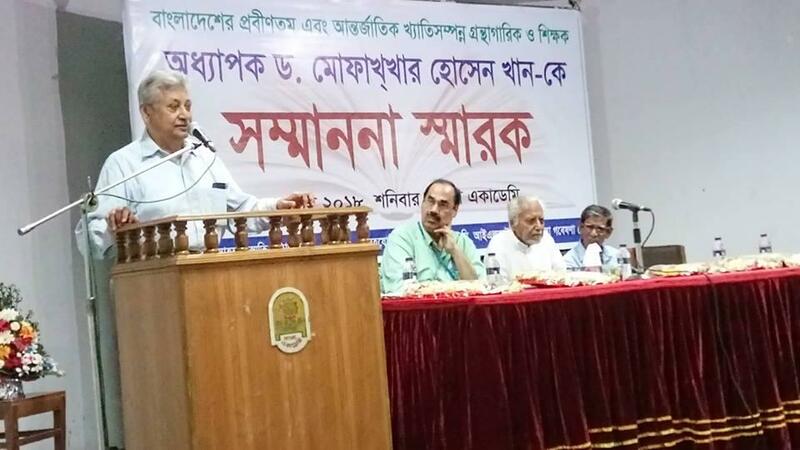 Professor Shamsuzzaman Khan, Director General of Bangla Academy, is giving a reception to Dr Mofakhakhar Hossain Khan. Invited guests and speakers shared their opinion on the knowledge-based society and its legacy towards civilization and how the library played a pivotal role, what contributions of Dr Mofakhar had towards the society. Attended guests criticized the result oriented education system, memorizing system, misuse of technology. How the society can overcome these challenges also pointed out. Sufficient budget for library and with the modernization of it by converting the characteristics of true information, special mark for using the library at school level may be the solutions to face the prevailing problems. To know more about Prof. Dr Mofakhar, read his short biography here.